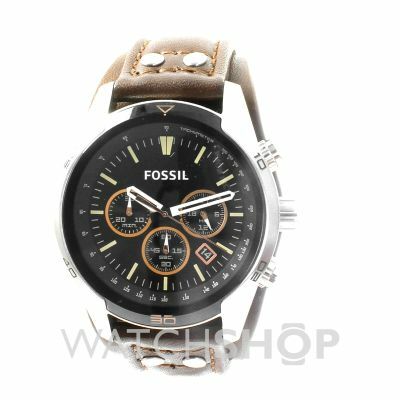 Fossil Coachman CH2891 to przede wszystkim niezwykle porywający zegarek męski. Materiał, z którego wykonana jest koperta to stal nierdzewna, co świadczy o wysokiej jakości produktu, natomiast kolor tarczy jest czarny. Zegarek wyposażony jest, między innymi, w chronograf (stoper) i funkcję daty. Jeżeli chodzi o wodoszczelność, zegarek jest odporny do 100 metrów. Oznacza to iż jest zbudowany z myślą o pływaniu i pytkim nurkowaniu. Zegarek jest wysyłany z 2-letnią grawancją i oryginalnym opakowaniem od producenta. Got this watch throught today. Quality product im very happy with. If it keeps time well its an absolute bargain. Fantastic. What a handsome looking watch!! Solid, sturdy, stylish. 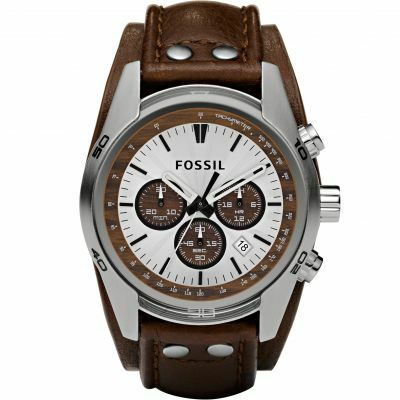 The dark brown real leather strap compliments the face, which glows in the dark so bright.. I know this because my husband wears it in bed and feels that he has to share the time with me throughout the night!! He says its such a comfortable fit. He doesnt need to wear his glasses to read the time as the hands /numbers are a decent size and clear to see. All in all a great all rounder. Would recommend this one without hesitation!! Wanted a daily beater - something that looks nice but has a leather strap and at a price that I dont have to worry all the time. Its a fairly big watch so not really for small wrists. Overall very happy and can be priced nearly at double this price on certain websites. Just buy it you wont regret it. I am not a brand snob mind you. tag owners will simply laugh at you but most dont know a quartz from an eta movement . Amazing watch, very stylish and sleek looks absolutely great with everything. Beautiful styling and very easy to set the date and time on with a very good stop watch feature. Love the watch! The leather for the cuff is really good quality and the watch face is really clear and readable at a glance unlike some watches. Id definitely recommend buying it! Love this watch, looks stylish and can be worn with smart attire as well as casual. Excellent quality all round. Would also like to commend The Watch Shop for their excellent service. I ordered the goods on a Sunday and it was delivered Monday, dont come much better than that!! Really nice watch, seems good quality and durable, fits well and comfortable too. The packaging was also a nice surprise, nice tin! Great watch, well made and looks the part! It was a gift for my brother. He loved it. Looks good and a quality product. I would recommend it. Excellent product, very quick delivery, would recommend. Fantastic looking watch and feels great. Watch is just what I wanted , its a well made item it looks good . Excellent good value product. Ordering simple and delivery to goldsmiths for safe collection worked really well for us. Lovely watch for my sons birthday. He loves it. An excellent watch & an excellent service. I will recommend WatchShop to my friends & family unreservedly! Im really pleased with my purchase. 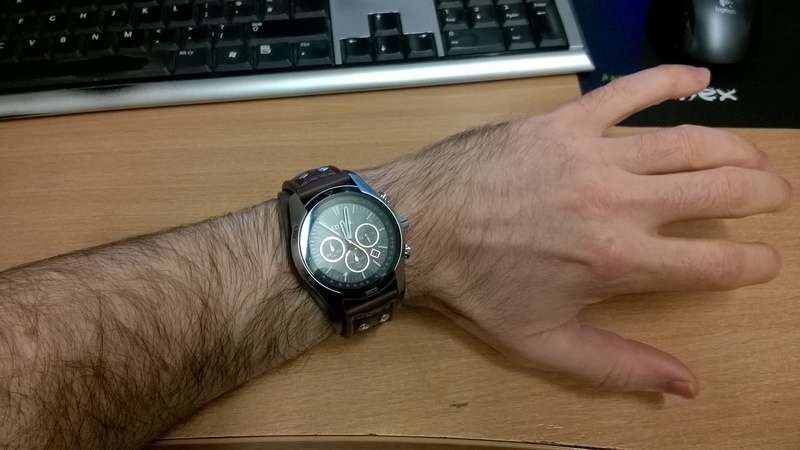 The genuine leather strap is great quality and not a garish shade of brown, its a nice colour. The stitching on the strap is done well, the leather has been cut accurately and the watch face is very well made and easy to look at/read. The watch is quite big so it looks very masculine but its not heavy or chunky. I think its the perfect size and weight for an every day watch. Im happy with the service from Watch Shop. It was dispatched the next day and collection from my nearest store was fast and simple. The Watch Shop price was also very good, particularly as the same watch retails for £125 in other high street stores. Overall I am very pleased with my purchase and would definitely recommend both this store and the product. The watch also comes presented in a lovely little tin which would be nice for trinkets. I had been searching for an excellent quality, expensive looking watch as a gift for my boyfriend who loves watches and this really fits the bill. Im sure he will love it. This watch also looks much better in person, the photos dont do it justice. Communication re the location of the watch while being mailed was fab! Very nice product, well made and an excellent price - best I could find! The watch looks lovely. Its a gift for my partner so hopefully he will like it! Nice looking watch. Leather strap is good and strong. Face clear. Colours great - husband very pleased with my choice. 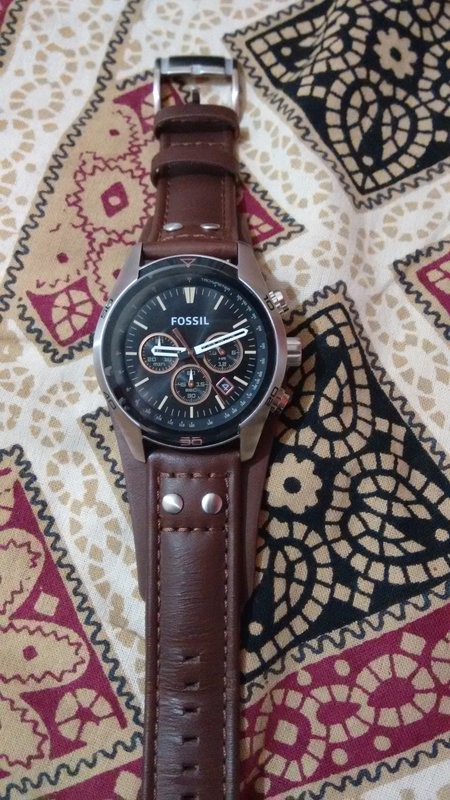 Second Fossil watch I have bought him and not disappointed with either watch. Looks as good on your wrist as it does on the screen!!! Proper excellent watch - great weight to it so you know its there... looks awesome, feels awesome, does plenty! Really nice leather strap - wide on the front, narrow on the back - this sounds weird, but means it feels very comfortable and doesnt pinch which some leather straps can do. Love it. 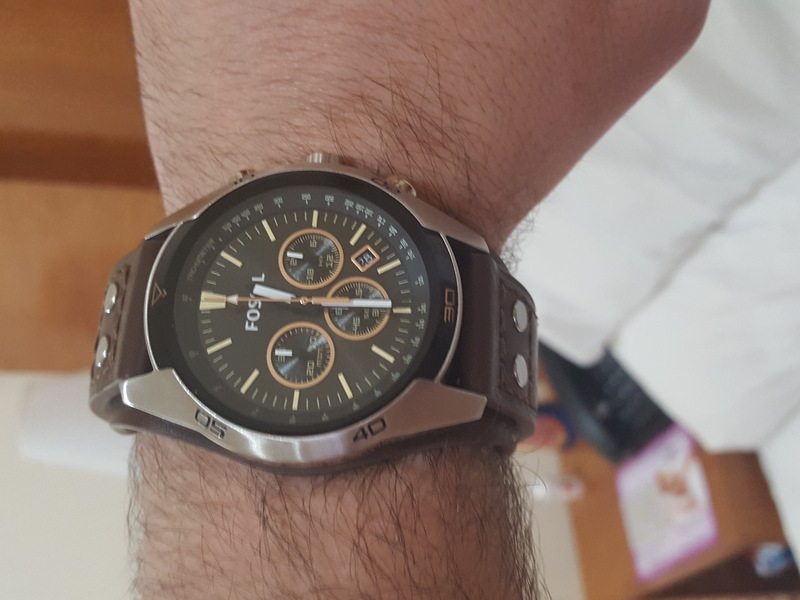 Great watch, feels very light and comfy with the leather strap, dose not fall around the wrist very snug fit, hands clearly displaying all info at a glance, and just the right size on the wrist. This watch is very great value and really excellent product.I bought this watch to my husband for Christmas. My wife brought this watch for my birthday and I have to say it a lovely gift. A well made , sturdy and good looking timepiece. 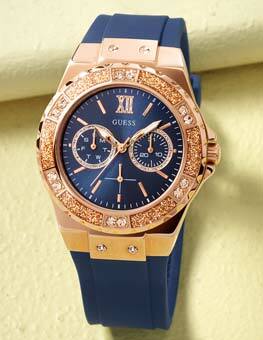 So ladies if your stuck for a present for him indoors you cant go to wrong with this watch. Absolutely stunning - the perfect gift for my husbands 40th!! Christmas present for hubby. Very masculine but elegant watch. I know it will be very much liked at Christmas. Delighted with the watch and the whole ordering process. Fast, efficient and smooth. Ordered from the platform at Kings Cross, on a mobile at half six in the evening. Arrived within 48 hours, that is impressive. The watch itself is excellent, looks good, feels good and tells the time. Im looking for the next one now. Watch is even better looking than in the picture. Very nice watch and not too bulky, this was the type of thing I was looking for but couldnt find anywhere. Bought this for my husband about a month ago. He has quite slim wrists. This watch fits nicely. Looks lovely too. A month in and it looks like new. Hes had quite a few compliments wearing it. It is a big watch but doesnt look out of place on a smaller wrist. Worth the money I feel. I bought this for my husbands birthday. The watch is exactly as displayed on the site. I was afraid that the watch will be to heavy but it isnt. Its coming with nice box. Very pleased with my purchase. I bought this watch for a birthday present and it is perfect. The colour and style are great, love it!!! This is a really lovely watch. I really love this design. 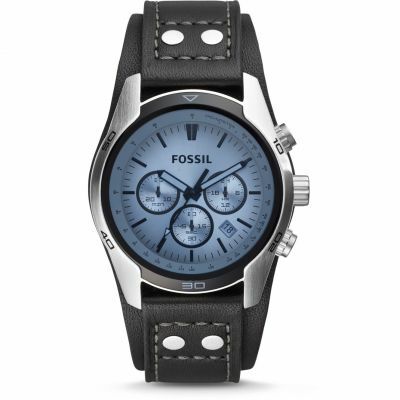 My partner had a similar design before from fossil and as it was his birthday coming up wanted to get him a new one. I love the cuff design, its a very stylish watch which looks fab if youre wearing smart or casual clothes. The leather strap Im told is very comfortable. Its just an all round lovely watch and my partner absolutely loved it. There is actually nothing not to like about this watch. If I had to write a negative it would be to do the straps in different colours too as not everyone likes the same, for example there is a similar fossil watch to this but I didnt like the colour of the leather strap at all...but thats just a very small criticism. Overall I would buy this watch time and time again if I had to. Big thumbs up from me and my partner! The watch itself is amazing. very cool look. The box however was not what i expected. it also had a dent in it. Really nice watch. I bought this for my husband and he loved it. Very comfortable to wear and looks great. The leather strap looks hard wearing. Best price on the internet. Very pleased with this watch. It is really comfortable and has a great clear face. The glow in the dark hands are more useful than I ever expected them to be, as is the chronograph function. I have had lots of people admiring the watch, asking me where I got it. I have just received this watch which is for my boydriends birthday in May. 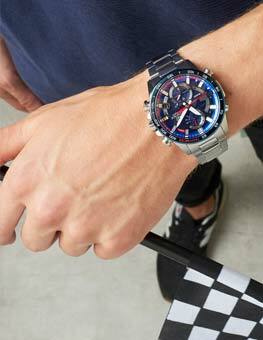 I looked at lots of watches before seeing this one and was impressed with this as soon as I saw the picture on the website. The watch looks even better in real life. It is big and chunky in a masculine way without looking OTT and looks really expensive. I havent actually given my boyfriend this yet but cant wait to see his reaction as Im sure he will love it. Nice blend of modern and classic with leather strap and sturdy under strap. Black face with white hands seems most attractive option. Controls are pretty simple though not sure how frequently I will use the chronograph time functions, well see. Only criticism is the size of the face and the under strap could be more streamline, they are quite chunky underneath a shirt cuff. I know its not meant to be a dress watch but it would benefit aesthetically and practically none the less from being a tad smaller say 5% inc the depth of the watch casing itself. Branding is discreet which I like also. Really pleased has this as a present for Christmas.Top quality watch looks good on and was easy to set up couldnt have picked a better watch myself.You can feel the quality as soon as you pick up. Even survived me dropping it just a small mark. Great watch has a nice chunky feel which is what I was looking for. I wanted a watch that looked casual but without looking cheap. The white hands on the black face is very clear and even at a glance you can tell the time which I didnt find with the other models. The date being down at an angle isnt ideal but still useful. The strap is very thick so hopefully will be ok for sometime. Havent tested it with water ie in the shower doesnt look like the sort of watch that u can have in water for too long. Warranty very clear 12 months on the watch 3months on the strap. one word Excellent for the product and one word for Excellent for the WatchShop. very much happy with the watch and the service. No words about the watch. About the service, I booked it on sunday 10pm and got the delivery on Tuesday 9am.So very happy. I bought this watch for my grandsons 18th Birthday later in January. I bought it early in the Christmas/January Sales as the price had dropped by more than £30 since first targeting in November. The watch was promptly delivered within 3 days of ordering to my daughter who lives in Northern Ireland, we live in England. I also paid a little extra for the watch to be gift wrapped. Therefore, I have not physically seen the watch nor has my grandson as his birthday is not until the 18th Jan. From my point of view I was pleased with the transaction: the price the choice and the delivery. 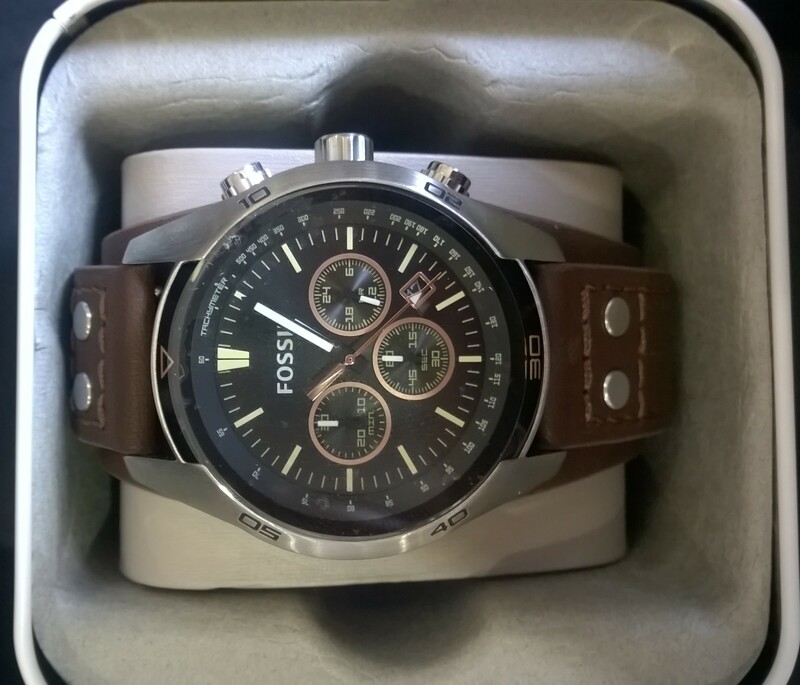 This is my second purchase as I bought a similar watch for my eldest grandson in 2013.I am sure this grandson will enjoy his new watch as he was allowed to choose. I got this watch from my wife for Christmas and absolutely love it. I cant stop looking at it when I wear it. The style, design and feel of it are excellent. Well made and the person I bought it for was very happy with it. The small minute and second watch faces act as a stopwatch feature and the small hour hand acts as a 24 hour indication. The watch is also very comfortable to wear. I am really happy with my purchase. It is a gift for my husband. It arrived on time, well packaged and the watch is a really good standard. I love this watch because its perfect for my husband and exactly what he wanted- casual, trendy and very good quality. This was bought as a gift, and Im really pleased with the style. 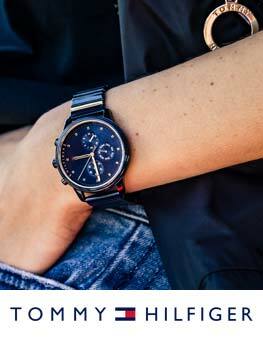 The watch looks stylish but robust enough for an active job. I actually wanted the White face, but seem to have ordered the black one by mistake, however Im not disappointed. I think my other half will be equally pleased. I am very happy with my purchase! The delivery was very fast. I would definitely shop here again. Excellent service from the Watchshop with a speedy turnaround on my purchase. As for the watch, I could not be more please. This watch is every inch quality. 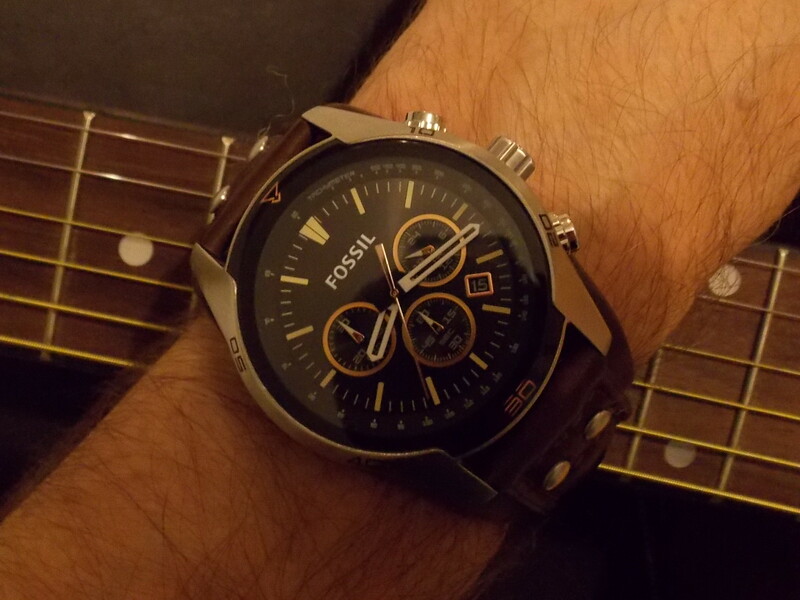 This is my first Fossil watch, and I will certainly replace it with another Fossil. 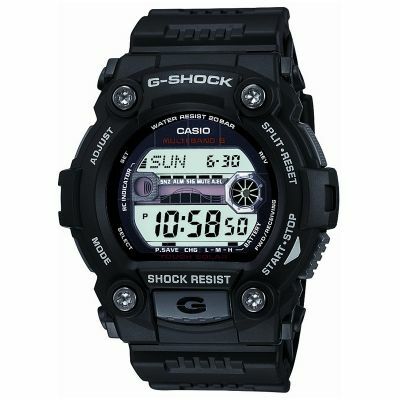 Excellent watch,nice comfortable fit & clear easy to read face that glows in the dark so you can even read it in darkness. Strap is nicely stitched & very sturdy construction, easy to follow instructions on setting the date & time. Watch is excellent value for money & I would recommend it to anybody looking for a inexpensive watch that looks & feels like some of the more expensive watches out there. Overall a great timepiece. The product itself is excellent. Well packaged and well delivered by the company. Very happy with the product. Ive been waiting to buy a watch like this for 3 years and finally have and I couldnt be more happy. My husband loves the watch! Great gift! Looks expensive, good quality, easy to read. Very masculine look. Love the dark background of the face which makes the dials more clearly visible at a quick glance. Great quality leather strap.Fantastic price compare to the manufacturers website price. Good, steady watch that looks relaxed and smart. The three additional clock settings are very small and not practical. Nice strap and comfortable to wear. Not as big as you think from the picture. It is a fantastic product, watch looks very good, The delivery was fast. Very happy with the product, also price was much better than in the shop. Quick delivery. Would highly reccomend using this site! Watch received. Thank you. Not checked as this is a Xmas gift for our son. Would be happy to order again in the future. With its awesome blend of urban appeal and stylish good looks, the Fossil Coachman stands out above watches retailing for much more. The clear, well designed, face is very easy to read and the substantial leather cuff/strap so comfortable to wear. Ive seen many watches in the last few months, but Im well pleased I hung on for this amazing time piece! I bought this for my husbands birthday. 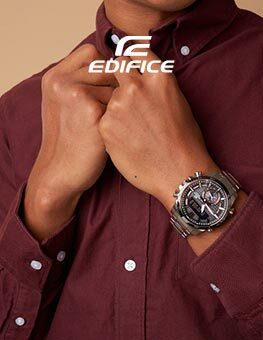 His comments: the leather strap is extremely comfortable to wear, the dial is easy to read and the functionality is good. 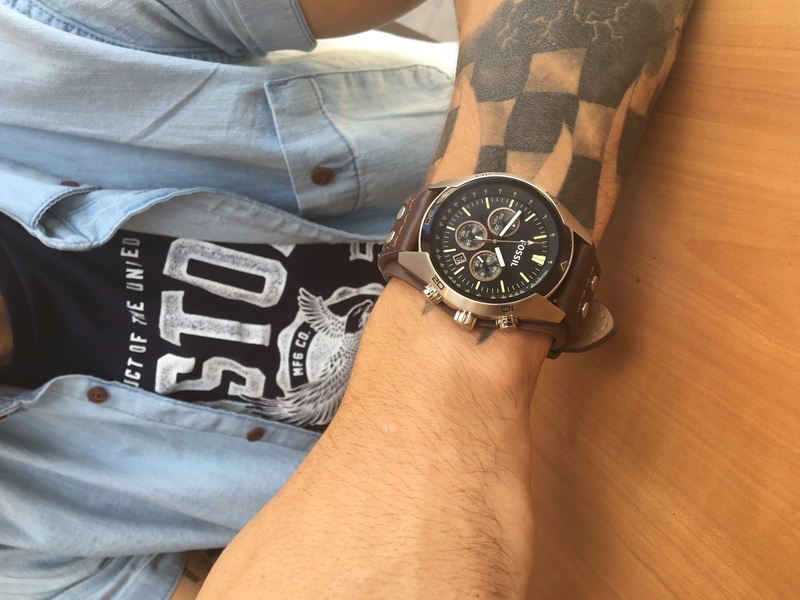 The face is quite a lot larger in real life than the picture implies but overall this is a good looking but rugged watch that goes with everything. Super fast delivery. Recieved order within 2 days of purchase even though I purchased at the weekend. Product is of high quality and came well presented so perfect to give as a present. Will order again! Very pleased with this watch its just what my husband wanted. I ordered from the Watch Shop as we had already seen it in a high street jewellers but it was more expensive so this price online with free one day delivery was great !